MARS Conquers Canadian XC Championships, Winter Training, Craftsbury and More! 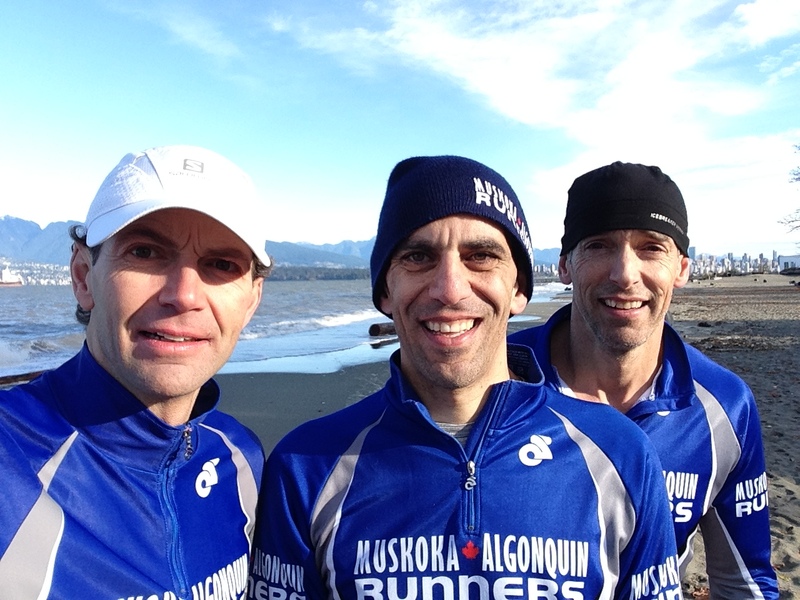 Muskoka Algonquin Runners were busy this week in Vancouver. Traveling to Vancouver to compete in the Canadian XC Championships were Troy Cox, Pierre Mikhail, Frank Ackermann and Nathan Jefferey. Nathan competed in the Youth Men’s event which launched the day of of races and had a strong race. MARS entered a team in the 8K Masters race in the Men’s 40-49 category. In tough conditions, the team of Troy Cox, Frank Ackermann and Pierre Mikhail placed 3rd overall. Troy was 10th overall, Frank 15th and Pierre was 30th. The race started with 121 athletes with 101 completing the tough 2K loop. 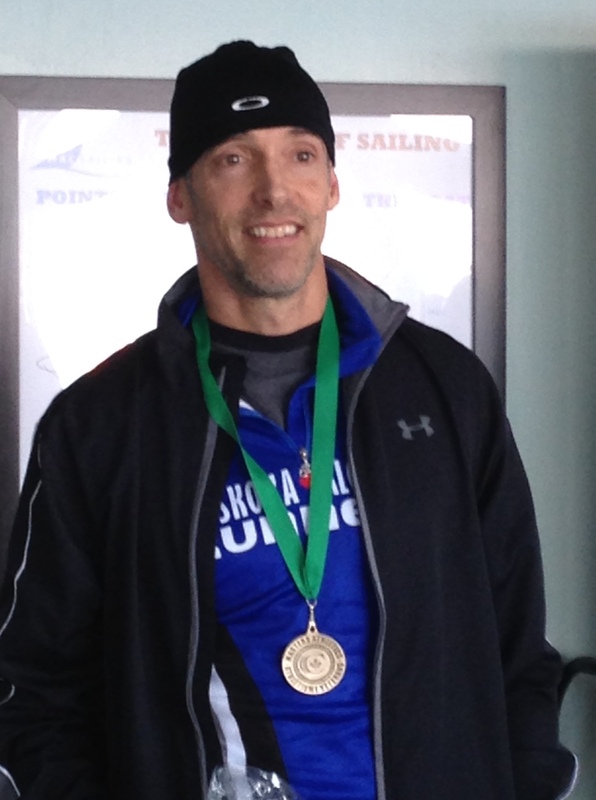 Troy also won a silver medal in the Men’s 45-49 division. It was a great finish to the XC season for MARS. The club now looks forward to the Canadian XC Championships returning to Ontario from 2015-2018. The races will be in Kingston starting next year. In addition, it has been announced that in 2015 the Ontario XC Championships will be in Etobicoke.MARS will take a break this week before launching into its winter season. Club runners will gear up for spring races including Around The Bay 30K in Hamilton and spring marathons and half marathons including The Boston Marathon, Toronto Marathon, Mississauga Marathon and Ottawa Marathon. Why train alone when you can train on MARS? Beginning the week of December 8, workouts will be Tuesdays mornings at 6:30 am from the Summit Centre parking lot, Thursdays at Noon, meeting at Highway 60 Tim Horton’s and Sunday mornings at 7:30 am from the Summit Centre parking lot. See Calendar tab for details. New runners can try MARS out for free in December. Come out to any workout in December at no cost. Come to our Run to the Pub event December 11. Run from behind Algonquin Outfitters at 4:30 pm and/or join us at the pub at 5:30pm. Memberships for 2015 will be available soon, once Athletics Ontario sets its 2015 fees. We expect the basic noncompetitive membership to be in the $20-$25 range. Our club fee is an additional $5. Stay tuned. MARS will be returning to The Craftsbury Outdoor Center in Craftsbury, Vermont in 2015. We will take up to TWELVE local high school runners to the High School XC Camp, joining other high school runners from around North America. We will depart Saturday June 27 and return Saturday July 4, 2015. Runners have to be in high school or entering high school in September 2015 to attend. The runners are coached by Olympic bronze medallist and three time World Cross Country Champion, Lynn Jennings, in addition to NCAA coaches and NCAA athletes. Many local runners met and ran with Lynn when she came to Huntsville this past October. This camp is a very unique opportunity. Our runners have participated the last two years. It was an incredible experience, not to mention, an incredible camp setting in northern Vermont. Each year, the camp fills quickly and spots have already been filled this year. There are only 25 total spots available in the camp in 2015. Last year the camp was full by early March. The cost of the camp is $649 US plus a travel fee of $150 – $200 (exact amount yet to be determined) which will cover rental vans, gas, and one night hotel en route to Craftsbury. In addition you must be a Muskoka Algonquin Runners member to attend for insurance reasons. The current cost of a one year membership is only $20. The camp provides supervision for the kids upon arrival and there would be two adults traveling with the group like last year. Families can also book accomodations at the Center as it is not just a camp but an Outdoor Center. The total cost of this camp is extremely competitive compared to local camps and offers a very unique running opportunity. (1) Go to www.craftsbury.com and register for the June 28-July 4 camp. Details of camp life can be found at the website as well. Email me at pmikhail@me.com to reserve a spot in the vans. (2) Call Craftsbury to give them your deposit (last year $250) to confirm your reservation. (3) Get/renew your Muskoka Algonquin Runners membership for 2015 (last year $20/year) which also allows you to go to any MARS training sessions all year and particularly in summer. (4) Go to www.muskokaalgonquinrunners.com/membership for details. (5) Runners will require a valid passport, out of country health insurance, and a permission for travel letter. The club will try to arrange for the travel documents to be completed at no cost but that has yet to be confirmed. ← MARS Crushes Ontario XC Championships and More!